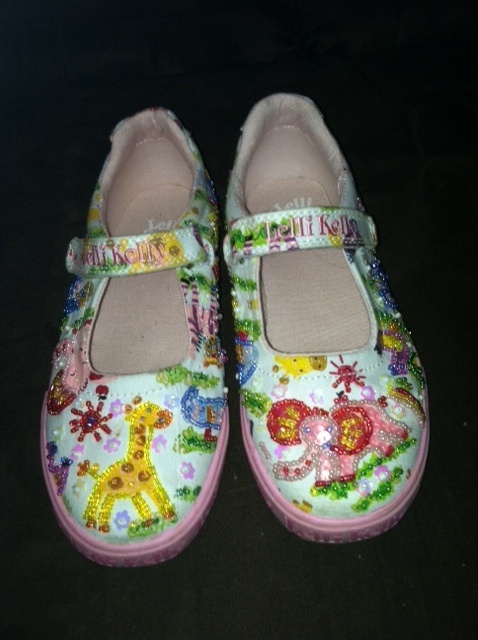 If you are the mom of a little girl, you probably have heard of Lelli Kellys. They are not new to the cute shoe market. In fact, they made our list of the cutest kids' shoes HERE. We really love their new Zoo collection, and we were fortunate enough to try out our own pair! In case you did not know, Lelli Kellys are not only ADORABLE, but they are super comfortable as well! My oldest has worn them several times, and adores them (and I adore that they fit well). The do come with a sole that is removable in case your child is in between sizes. The new zoo collection is really quite special. First, you wear them, like above, mismatched. My daughter LOVES wearing mismatched socks, earrings, and now shoes! Not only is this quite the fashion statement, but it has a learning element as well. The shoes help children to distinguish between left and right at an early age, with (in the case above) a giraffe on the left and an elephant on the right. Since you buy each shoe seperately, you can choose mismatched shoes (as shown above), or to purchase them matched. MamaBreak received Lelli Kellys to review here on the website. We did not receive any other type of compensation. As always, our experiences and our opinions are our own. These are super thank you for sharing! I saw these on your shoe list the other day and they are the absolute cutest shoes.